Barely two days to the AFCON group L qualifier against Tanzania Taifa Stars, the Uganda Cranes intensified their drills with a double session on Wednesday at the Mandela National Stadium, Namboole. 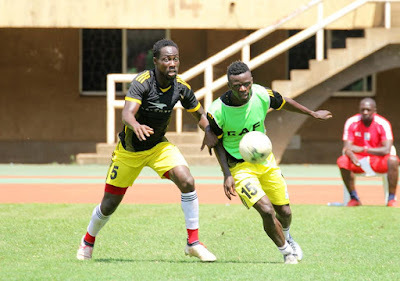 The Cranes held a morning training session that was joined by one in the afternoon with emphasis laid on all aspects of the game; winning and retaining the ball possession, quick break on the counter, crossing, scoring as well as defending. Both sessions lasted for one and a hour hours each. With the arrival of the four European based players Yunus Sentamu, Faruku Miya, William Luwagga Kizito and William Opondo, the camp is full. For starters, Luwagga is a newly signed player at Belarus club Bate Borisov, Opondo plays at Danish club Vendsyssel, Sentamu turns out for FC Tirana in Albania as Miya has just completed his move to Gorica Football Club in Croatia. The quartet will definitely offer options to the Uganda Cranes technical team. The team is set for other sessions on Thursday morning and Friday (2PM) before facing long-time rivals, Tanzania on Saturday. Uganda and Tanzania lock horns in a group L East African derby game that will be handled by West African referees. Gabonese referee Eric Otogo-Canstane will handle the center refereeing tasks, assisted by Moussounda Montel (Gabon) and Chad’s Issa Yaya as first and second assistants respectively.